Identifying the risks and vulnerabilities along the North Atlantic Coast from Maine to Virginia. Anyone living in New York would assume this is Hurricane Sandy that devastated the region just a few years ago. It's actually the Great Hurricane of 1821. "This is not the first time the region faced a hurricane the size and strength of Sandy and it goes to show that another Hurricane Sandy could occur in the future," said Bryce Wisemiller, project manager, U.S. Army Corps of Engineers, New York District. 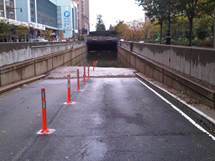 This image shows the entrance to the Battery Park Underpass in downtown New York City in the aftermath of Hurricane Sandy. Credit USACE. The study is entitled the New York and New Jersey Harbor and Tributaries Focus Area Feasibility Study. The study is an offshoot of a comprehensive study that was performed by the Army Corps right after Hurricane Sandy that identified risks and vulnerabilities along the North Atlantic Coast from Maine to Virginia. "From this comprehensive study, several regions were identified for further study including the big sleeping elephant in the room that was basically ground zero for Hurricane Sandy - the New York and New Jersey Harbor and tributaries area," said Joseph Vietri, who headed the comprehensive study and who is the Director of Coastal Storm Risk Management National Center of Expertise, North Atlantic Division, U.S. Army Corps of Engineers. 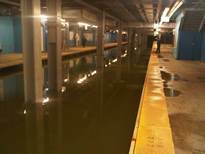 The above image is a flooded New York City subway system in the aftermath of Hurricane Sandy. Credit: USACE. Wisemiller said, "An additional study will be done in this region of approximately 16 million people because it was one of the hardest hit areas during Hurricane Sandy." "Not only that, the region is also apt to still have those same risks going into the future, even though there are a number of projects and studies on the way." The Army Corps will work with many agencies on this study from New York and New Jersey including the New York State Department of Environmental Conservation, New Jersey Department of Environmental Protection and the New York City Office of Recovery and Resiliency. Will work be done in my community? "The geographic scale of this study is vast," said Olivia Cackler, Coastal Section Chief, U.S. Army Corps of Engineers, New York District. "Typically our studies focus on a municipality or a watershed; this one encompasses many watersheds and 900 miles of coastline in New York and New Jersey with the New York and New Jersey Harbor as the focal point." Cackler is the Lead Planner for the study. This will include communities in New York including the South Shore of Staten Island, Jamaica Bay, Rockaway peninsula and Western Long Island Sound. Communities in New Jersey including the Raritan to Sandy Hook shoreline, Arthur Kill, the Kill Van Kull, Newark Bay, and the Passaic and Hackensack Rivers. As well as the harbor area including the Upper Bay of the New York Harbor, the Hudson River, East River and Harlem River. Wisemiller added that more communities may be added as the study progresses. What types of risk reduction measures are going to be constructed in my community? Vietri said each community can help to guide the plan that will most adequately benefit them and what they value. A full range of risk reduction measures are going to be offered to communities and include structural, nonstructural, and natural and nature-based features. Cackler said that structural measures are designed to reduce the frequency and intensity of flooding. These measures can include putting up a floodwall, levee, beach fill, dune, or an offshore barrier. Nonstructural measures focus on reducing the amount of damages without addressing the flooding. This can include such things as elevating or buying out a house, wet or dry flood proofing, evacuations, and zoning changes. Natural and nature based features try to reproduce natural defense mechanisms. This can include creating marsh islands and wetlands, aquatic restoration and placing sand on beaches. Communities can assess these measures and alternatives and make decisions based on what they value. Vietri said, "You have communities that value natural and nature based features a lot more than structural alternatives. They can increase what they see as important and downplay what they value less. To say that everything should be the same is totally not correct." Cackler agreed that a one size fits all approach doesn't work. "We have a very diverse study area in terms of topography and land use. Using a combination of risk management measures allows us to tailor our approach by using the most appropriate measures for that community." By having a wide range of alternatives, communities can also compare various levels of protection. Vietri said, "We want them to compare doing a breakwater verses a wetland. Both do two different things. Yet both working together provide even something much more different. We want them to not just engage and review the alternatives in the study, but to help advice the Army Corps and to me this is a pretty significant change in how we resolve these sort of problems." Before communities weigh in on what blend of measures they want, the U.S. Army Corps of Engineers performs a cost-benefit-ratio. Wisemiller said this ratio must show that the benefits of the project outweigh the costs. The plan with the most net economic and environmental benefits to the nation becomes apparent through this process. How communities decide may bring tradeoffs. "There are benefits and risks with all combinations of coastal risk management measures," said Wisemiller. "The study will look to evaluate and weigh the different approaches with the full involvement and input from the regional stakeholders and the public." Did you learn anything from Hurricane Sandy that will be part of this study? "Yes and you'll see it in everything we do for generations to come," said Vietri. "When you have something like Sandy that cleans the slate you have an opportunity to do something in a different and smarter way." He added that projects that are in place now are already benefiting from what we learned from Hurricane Sandy. Wisemiller agreed, "Hurricane Sandy illustrated, all too well, the risks that this area faces from coastal storms, both in terms of property loss as well as the unfortunate loss of life." Vietri said, "Places that people thought they could go to get out of the high water turned out not so much. Sandy upturned a lot of what we thought was the floodplain. Because of Sandy, the team will take a relook at the scale and scope of the floodplain and this could lead to improved hurricane evacuation planning, mapping of evacuation routes and shelter in place locations. Sandy also confirmed that some existing measures are already working. Cackler said, "It was discovered after Sandy, areas that had an Army Corps project in place, such as beach fill or levees, fared a lot better than areas that did not have a project. Even when there was some flooding, it was substantially reduced from what would have happened without the project in place." Vietri agreed, "There are places in New Jersey where there were healthy beach and dune systems. After Sandy, the people in these areas had minimal damages. Literally, 200 yards down the beach where there was no project there was complete devastation. Houses and roads gone." Will this study factor in possible climate change and sea level rise over the next 50 years? Vietri said, "Whatever you think is the cause of climate change, the fact is the seas are rising. And we are going to have to take it into account in our future plans." He added that it's predicted that future sea level rise could rise anywhere between one to six feet over the next 100 years. "That's a pretty big envelope in which you're trying to plan a design," said Vietri. Cackler said, "How we deal with planning uncertainty is with Resilient Adaptation." This allows us to adapt to the changing conditions as we see them in real time. She continued, "There are three sea level rise scenarios that we have to consider when we look at our risk reduction measures." "For example, let's say we assume that there is going to be low or moderate rate of sea level rise and we design a seawall to hold up to this. Years go by and we actually see a high rate of sea level rise. If we keep in mind Resilient Adaptation, we can construct the seawall with a larger base so that it would be possible to add to its height instead of having to build a new, larger seawall." Vietri said that many people ask him why the Army Corps doesn't just construct measures that cover us for the highest sea level rise scenario so it will cover everything. He tells them it's counter intuitive. "If you go with the bigger plan that means you're assuming more damages. This also means your environmental footprint will be larger and your environmental impact greater," said Vietri. "For example, instead of needing 100 yards of sand to replenish a beach, you might need a thousand. Bigger impact to the environment." Are we actually going to see something happen from this study? There is definitely interest to get this study started said Cackler, "This study is so important that multiples staff from New York and New Jersey and the U.S. Government worked tirelessly to execute the agreement to start the study." Vietri agreed, "Funding is coming at a faster rate to do these studies even in this era of tight funding." Vietri believes that in order for the study to be successful everyone has the responsibility to look at these changing conditions and to make better decisions. He said that this requires an adaptive mindset and he is happy to say that he is seeing it. He said one example of this is that he is seeing more agencies get tougher on developers who want to build in flood zones. "I haven't seen this in my 30 year career with the Army Corps," said Vietri. He said he also sees this changed mindset in himself and in his colleagues. Like many in the Army Corps, he worked on several critical missions for the agency, such as Hurricane Sandy. He said, "What gets me the most is the impact to people. The look on their faces and the helplessness. I'm also struck by their resiliency. It pushes you to try to do something bigger and better, to search for answers that would help to reduce or eliminate this human tragedy. If you think I'm passionate about it. I am. We have to be. Otherwise we will cease to exist as an organization." Wisemiller said that the team will strive to complete the study as quickly as possible, without undercutting the quality or level of rigor in the analysis. He said that studies typically take about three years, but that this study will need more time. The study is expected to result in a report of implementable solutions that will be presented to the U.S. Congress. Wisemiller said they are seeking public participation throughout the entire study. He added, "The goal at the end of the day is not to have a controversial report that doesn't lead to anything productive and useful. We want something that not only informs the region of the risk that exists now and will exist further into the future, but also to provide solutions that we can implement with them."